As many of you have noticed, Kroger has begun strictly enforcing their eCoupon policy. So much so that now Kroger has officially updated their registers to prevent customers from using an eCoupon with a manufacturer’s coupon. Through email and in the comments here on the site, you have expressed concern because you now can’t “stack” paper and eCoupons, however please understand: The Kroger policy has never allowed that, their registers just did. The problem is that many of us load the coupons at the beginning of each month and don’t really track them at checkout. With the new policy, you have to be more strategic and only load the ones you need because it will not allow you to use a paper coupon if there is an eCoupon loaded. I don’t know about you, but I feel like that is more hassle than it is worth for the lower value eCoupons that DO NOT double. Don’t load eCoupons at all. While I love the additional savings and ease that eCoupons bring, that is just why I use them. They are easy. The minute they become difficult and cumbersome I will quit loading them, unless they significantly raise their value. Print a list of the eCoupons you have loaded on your card. Before heading out or even planning, print out a list of all eCoupons from Kroger, Cellfire, or Shortcuts so you know which eCoupons are actually on your card. That way you can take it to customer service if you need to seek an adjustment. Remove unwanted eCoupons. If you are planning your trip and determine there are eCoupons you don’t want to use, you can remove the Kroger coupons from your card. You CAN NOT remove Cellfire or Shortcut coupons once loaded to your card. Drop by Customer Service after checking out. At checkout, if you find your paper coupon is a higher value than your eCoupon, then head to customer service to see if they will let you use the paper coupon. The more we let the company know our issues, the higher the chance they will look for a solution that helps everyone involved. Do you have any ideas or tips to helping us use eCoupons loaded on a shopper’s card? Yes, I can offer my solution…PUBLIX!! (Kroger lost my business except to walk through their stores looking for the “orange” tag markdowns, which can be significant) Until they wake up and realize that unless we can “stack,” their card is pretty much useless, I’m OUTTA THERE!! One option for Cellfire is to load the coupons while you’re in the store (if they’re still available to load) using the app that’s available for iPhones (and possibly other phones). Might be too much of a hassle, but if it’s a great deal then it might be worth it…maybe. I don’t mind that Kroger is enforcing their stacking policy. I want to try to play by the rules as much as possible and this just assures me that I am. I doubt I’ll be loading those eCoupons much now. The one issue I do have is with the Kroger my magazine now coming electronically. I use those coupons frequently and now they’re only available as eCoupons which means I probably won’t redeem them as much as I did in the past. I wonder if Kroger will find that fewer of those coupons get redeemed? Be careful of loading ecoupons at the store. The ecoupon sites usually say it can take an hour or two to have your card updated with the new coupons. Why not check out, use your paper coupons, then have them swipe your card? 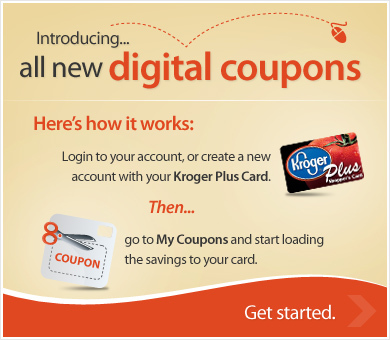 So coupons won’t double unless you use your Kroger plus card? I didn’t know that. When my e-coupons didn’t “take” (even though they were loaded fine on my card), I went to the customer service desk and asked them to adjust them. They said that is a “corporate thing” and they know “NOTHING” about ecoupons and I would have to call the 1-800#. Well, after being on hold several different times for 10 minutes or longer, I just gave up. So annoying. So, I’m with you Dori, I just go in for the markdowns and the natural section, then I head to Publix! There have been a few times in the past when my ecoupons did not work. I went to the service desk and showed them the coupons on the app on my iPhone. They gave me cash back for the coupons that did not work, which I thought was pretty generous of them. I have always been a Kroger shopper, but I hate to admit that Publix is actually becoming much more appealing in my eyes (esp. since they take competitor coupons!). I didn’t know Publix took competitor coupons – I know they don’t match prices with competitors. So can I take my Target and Kroger digital coupons (that say only redeemable at thes stores) to Publix? Does Publix have any type of card you can use to download e-cupons? The only reason I stil shop at Kroger is for the clearance items that I end up getting free after coupons. The buy one get one free deals at Publix are hard to beat – just don’t get stuff off sale because things like Hellman’s mayo will be $4.50 instead of less than $3.00. Does Publix let you use a coupon for more than the value of the item as a credit? One more question – I saw on the Extreme Couponing show tonight that one shopper in Buford, GA tried to use the e-coupons and the manufacturer’s coupon together at Kroger – her e-coupons didn’t work when she scanned her shopper’s card – but I have been told that the e-coupons don’t work until the end of your transactions, after you have paid – which doesn’t make sense at all. Is there anywhere you can use manufacturer e-coupons AND newspaper coupons? I know most stores will let you use a store coupon and a manufacturer coupon, but it gets complicated when e-coupons include store and manufacturer coupon s. If someone can clarify this for me, let me know. Thanks! Beware! Publix is changing their coupon policy too. It just hasn’t taken effect yet. So I was thinking about the digital coupons not taking with paper coupons, and someone had mentioned your coupons won’t double if you don’t swipe your plus card first. If your using the P & G coupons for example $2.00 off oral b toothbrush, ex $2.00 Olay soap that are already over a $1.00 and wouldn’t double anyways it won’t matter. So in a order using just those coupons you may be able to use both by waiting until the end to swipe your plus card??? how can anyone get mad that they can’t use ecoupons and mfgers? they are usually both manufacturer’s coupons. Sounds like you want to get away with braking the rules… it is stealing if you cheat! At kroger you can still use ecoupon and store sales just like you might do with a paper and store coupon. Just because you can GET AWAY with more, soesn’t mean you should.